Designed for use on wood, granite, laminate, marble, and other hard, sealed surfaces, this sleek steamer quickly and effectively sanitizes floors to gleaming perfection. The compact unit's ingenious steaming technology requires no harsh chemicals. Instead harnessing the power of pure steam to loosen and remove even the toughest dirt and grime. 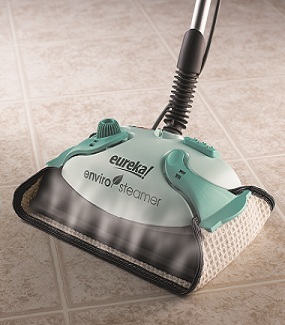 The Eureka Hard Surface Floor Steamer achieves a high degree of hygienic and degreasing power on floors. It turns water into steam in just a few minutes, so when contact is made with surfaces dirt and grime is removed. Since the floor steamer uses the active power of steam without the use of detergents or soap, it is safe for the environment. Furthermore, its generous 12-1/2-inch cleaning head maneuvers easily into corners and clean hard to reach areas. The length of the cleaning head helps reduce time to cover even large floor surfaces, while its 25-foot cord allows for hassle-free access all over a home, condo, or apartment. Another key feature of this vacuum is that the steamer weighs only 5-1/2 pounds when empty. 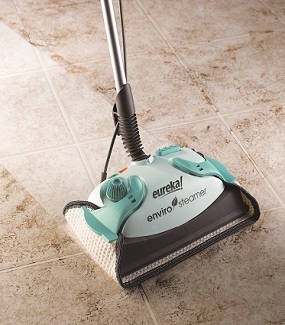 The Eureka Enviro Hard Surface Steam Cleaner eliminates the need for lugging around cumbersome wet vacuums or mops and buckets around to get the job done. The floor steamer is a new way of cleaning that is effective and hygienic. Under normal conditions, the floor steamer does not allow calcium deposits to adhere to the boiler so tap water is acceptable for use. Areas with hard water should use distilled water for better performance. The floor steamer can kill dust mites and some types of bacteria, such as salmonella and E-coli when used properly. • To disinfect a specific area, position the steamer over the area for a minimum of eight seconds. This allows the floor under the steamer to reach approximately 170°F. Use this procedure to disinfect floors near: bathroom stools, food preparation areas (not on kitchen counters), pet sleeping quarters, etc. • On surfaces that have been treated with wax or some no wax floors, the sheen may be removed by the heat and steam action. Do not use on unsealed wood floors or let unit stand on any wood floor for an extended period of time. This could cause the wood grain to rise. It is therefore recommended that a sample cleansing be carried out on an isolated area of the floor. • In order to guarantee perfect functioning over a long period of time the tank needs to be rinsed out with water once a month to eliminate any accumulated calcium deposits. Do not use vinegar or other decalcifying substances. Put in two measures of water, replace the safety cap and shake to loosen deposits. Remove safety cap and immediately empty water into a sink. • Ideally designed to clean to thoroughly clean floor surfaces, such as marble, ceramic, stone, linoleum, sealed hard wood floors and parquet.